↑ "World Cup 2010: Fifa and Ballon d'Or player awards to be merged". The Daily Telegraph. 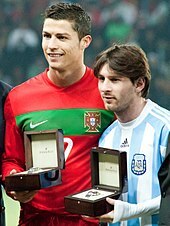 5 July 2010. http://www.telegraph.co.uk/sport/football/world-cup/7873133/World-Cup-2010-Fifa-and-Ballon-dOr-player-awards-to-be-merged.html. अन्तिम पहुँच तिथि: 15 January 2016.